Dunhill releases are few and far between. But fans of Dunhill cigars were gifted a full-body smoke by British American Tobacco at this year’s IPCPR Trade Show, the Dunhill Heritage. The three country blend is produced at General Cigar’s Danli factory, Honduras American Tobacco S.A., in five vitolas: Box-Pressed Robusto (5 by 50), Toro (6 by 50), Torpedo (6 1/4 by 52), Churchill (7 1/2 by 50), and Gigante (6 by 60). 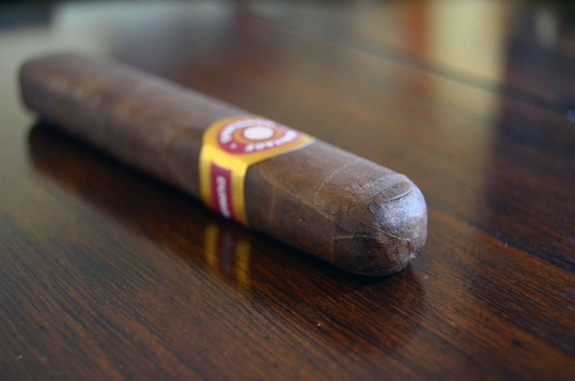 Prices ranges from $10.15 for the robusto to $12.95 for the 6 by 60 gigante. Dunhill cigars are distributed by General Cigar Co. in the United States. Samples Provided by General Cigar Co. 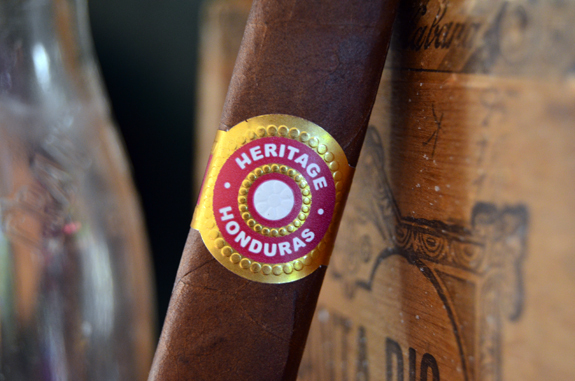 The Dunhill Heritage 5 by 50 box-pressed robusto is consistent in its medium brown wrapper that has a orange/rusty hue. Wrapper seams and small, dark veins are visible, but to the touch it is velvety smooth. Upon removing the Heritage from the cellophane, I am met with a pungent aroma of barnyard and vinegar. Once the pungecy subsides, more mellow wet earth notes present themselves. A rich, butterscotch smell is found on the foot, followed by a pepper spice that tickles my sinuses. The double cap has a small tear, wrinkles, and wavy lines, but gets the job done I suppose. Opting to punch the Dunhill Heritage, a stiff draw shows off more rich notes of cedar, sweet butterscotch, and some lingering pepper. Dark notes of wet earth, black pepper, and pencil-shavings are first to arrive on the scene. An unidentifiable sweetness is creeping up in the profile. There is some sort of sour, citrus dimension to the smoke and a diesel flavor lingers on the finish. An even burn, a firm, white ash, and the copious amount with each draw is making this an effortless smoke thus far. Let’s hope it stays that way. Barely making my way through the first third, I am already feeling a kick in the gut from the strength. The flavors are coming across lighter, or maybe more balanced, on the palate as I pull into the second third of the Dunhill Heritage. The deep pencil-shaving notes are the most dominant, paired alongside a chewy leather flavor. The sour quality remains in the background. Finally working up the nerve to retrohale the smoke, the pepper flavor is full but the spice heat is mild. The finish has developed to a much more pleasant flavor of vanilla that you would find on the nose of spiced rum. The cigar is chugging along as I am already half way through in 30 minutes. As I allow the cigar to rest in the ashtray, smoke pours of the Dunhill Heritage. The flavors are composed of char or burning wood, earth, pepper, and the sourness from earlier, Finally, an anise or black licorice sweetness has surfaced. The flavors have been full throughout and the strength has been hanging right in-line. 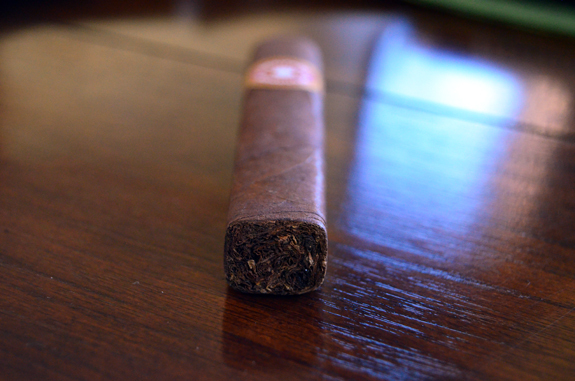 Early on in the Dunhill Heritage robusto, I was afraid the strength was going to overpower the rest of the experience. 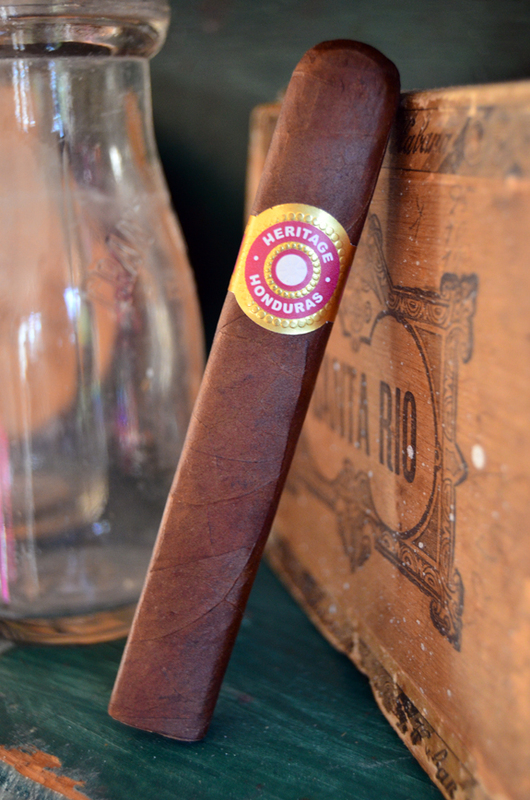 However, the strength remained a steady full without becoming overwhelming allowing the cigar to showoff its complexity in the flavor department. While the flavors were a bit heavy for my palate at some points, if you enjoy a full strength smoke and dark, heavy flavors this cigar may be for you. Those flavours sound amazing. Then again, I can’t resist anything with licorice notes. Denis, I paired one of the samples with a cup of coffee and the licorice notes were easily identifiable throughout the whole smoke. It was a completely different experience. I waiting to hear from Tony on if he picked up any of the licorice. It rare for me to pick up that flavor.